I've been meaning to make one of these for years. 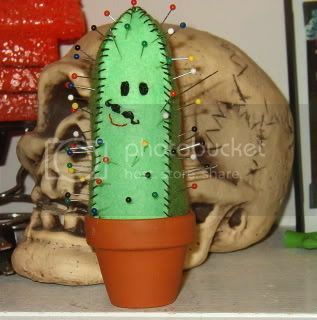 A happy, mustachioed cactus pincushion! His face is a little wonky cause I just freehanded it, but I like him. He's got character. Added 06/11/2007: Version 2.0... and he has a girlfriend! The shape worked out better this time, it's closer to what I had originally pictured. She was a custom order. I think they're a very cute couple. That's really cute! I love him! Mustachee! Oh my goodness! I ADORE it! awww he's so cute! i love his mustache. Now I kinda want to make a bigger one that I can cuddle. 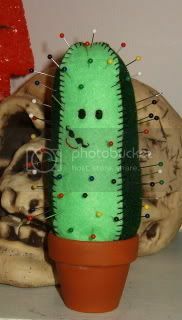 With no pricklies, of course. He's adorable! How big is he? How often do you water him? That is the most ridiculously cool and adorable thing I have ever seen. Mustachioed just seals the deal! 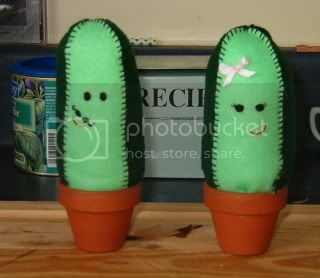 I love cacti...but I never recognized my love for mustachioed cacti until now!!! It's a moat. Filled with badgers. I love this, I want one! I wisted this lol.